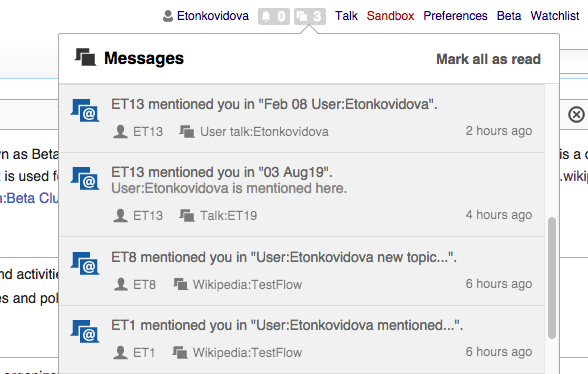 For the following notification types, we'd like to add a secondary link to the user page (with the label being the user name and the icon being userAvatar) of the agent to serve as a signature of sorts: a consistent way to indicate who performed the action you're being notified about. Where this secondary link is present, it should always be the first secondary link. Catrope added a parent task: T121661: Clean up lego message in user-rights notification. 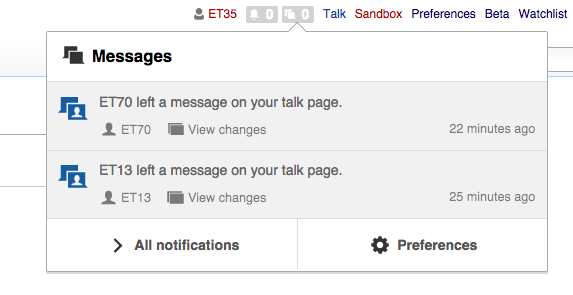 Catrope added a parent task: T121739: Remove user names from some notification messages in favor of secondary link. SBisson moved this task from In Development to Needs Review on the Collaboration-Team-Archive-2015-2016 board. The OpenStackManager ones work on wikitech. Moving this back to Q&A. 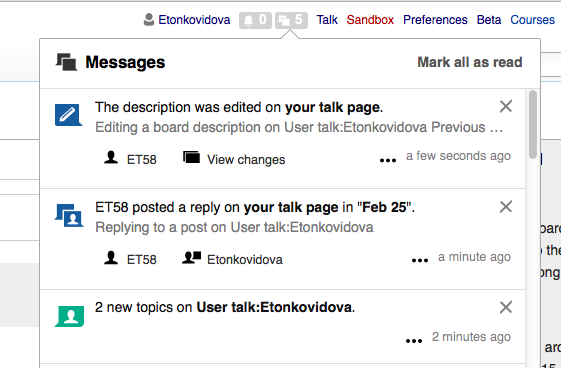 jmatazzoni moved this task from Product Review to QA Review on the Collaboration-Team-Archive-2015-2016 board. 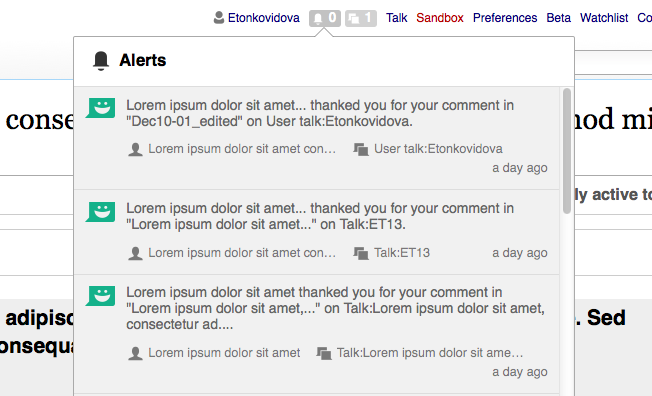 flowusertalk-post-reply and flowboard-description-edited - look/function according to specs - see the screenshot. 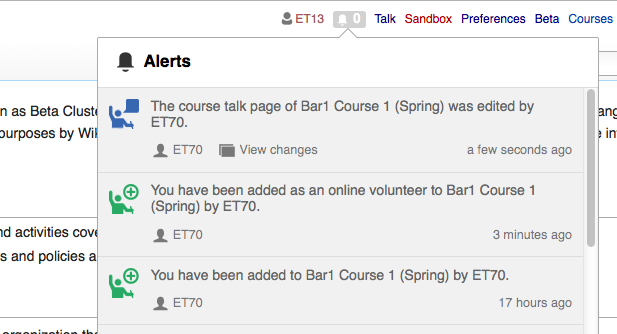 @SBisson flowusertalk-new-topic Primary link does not direct to "The Flow board, with sorting order forced to newest topics first]"
Currently, when clicked on flowusertalk-new-topic, the new topic page will be displayed. 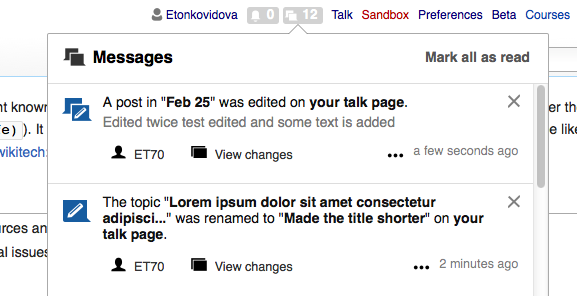 Note: When new topics are bundled, the primary link works according to specs. Is it possible that this was a mistake in the spec? Makes sense to me. I've updated the spreadsheet and requested comment. Meanwhile, @SBisson, please note that for consistency I've also changed the Primary Link Labels -- to View topic and View topics, respectively. Checked according to @SBisson comments - all specs are in place.